Very Good. In very good packaging. 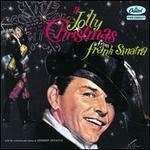 The Classic Christmas Album.